Sometimes it's easy to forget how far we've come because we still have so far to go. Although public outcries forced SNL to hire a black female as a featured player on the show after so many years, opportunities are plentiful for actors of color compared to what it was like in the past. And the roles are waaaaaaay more dignified. 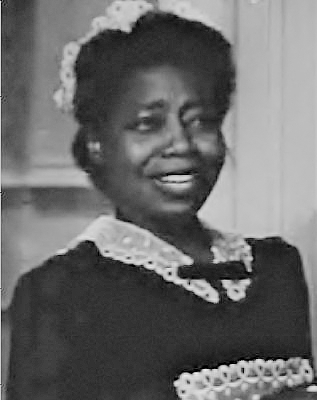 So as a reminder of how hard it was for black actors who had to accept roles that were beneath them, let's offer a special HBD tip of the hat to... Butterfly McQueen. RIP to Johannes Pääsuke, Estonian photographer and director (1911, b. 1892); Bimal Roy, Indian director (1963, b. 1909); and Iwao Takamoto, American animator, director, and producer (2007, b. 1925). WRITING: How do you write the perfect logline and why is it as important for your screenplay? FINANCING: What are 3 funding trends that can affect any filmmaker seeking investments or money in 2014? DIRECTING: Some thoughts on finding your directing style. SHOOTING: A writer explains his reason for choosing a particular camera to shoot an action movie with lots of parkour based on his book. LIGHTING: Why your film needs a good gaffer? SOUND: How do you set audio levels in FCP X, Premiere and Avid? STUNTS & VFX: How do they fake horse-riding in the movies? EDITING: How do you animate a still photo in post to create the cool slow-motion effect used in documentaries? DISTRIBUTION: What are the top 14 film markets around the world? MARKETING: Should indie films license products like Hollywood? LEGAL: So, what could have entered the public domain on Jan. 1, 2014? Finally, RIP to Sir Run Run Shaw, godfather of the kung fu genre, who died yesterday at the age of 106. His productions not only influenced me just as much as all the silent pictures, foreign films, Hollywood movies and experimental pieces that I love but also inspired me to become a martial arts instructor in Bruce Lee's art of Jeet Kune Do.